There are archaeological and other problems with the traditional sites. According to the work of Gabriel Barkay and Gordon Franz, the site of Gordon’s Calvary has a basic problem. Although the site has a tomb carved from a rock face, an adjourning garden, and was outside the Jerusalem city walls at the time of Jesus, the tomb has archaeological evidence that dates it to Iron Age II, which is significantly prior to the time of Jesus. Then, too, the archaeological evidence for the site of the Church of the Holy Sepulcher is also not convincing. This site was essentially chosen by Constantine’s mother, Helena, who came to the Holy Land in AD 326 in search of holy artifacts and with a desire to venerate various holy sites – both Helena and Constantine were led to the selection of holy sites by various “dreams and visions.” Although the site was also outside the walls of Jerusalem at the time of Jesus, it was the location of the pagan Temple of Venus, the goddess of love. The Temple of Venus had been erected by Emperor Hadrian in the late AD 130’s; so, if the site was sacred at all, it was sacred to the spirit of paganism, rather than as the place of Jesus’ crucifixion. Even so, some feel that Hadrian built the pagan temple over the site of the crucifixion. Still others have speculated that another site west of the city wall might have been the crucifixion site. Douglas Jacoby has stated that there is a lack of attestation related to the site of the Church of the Holy Sepulcher, as there is “. . . no mention of it in records of Christian writings before the 4th century.” Jacoby also sites the records of Eusebius, the church historian from Caesarea, who was familiar with Jerusalem and served in the court of Constantine. Apparently, Eusebius “. . . expressed surprise that the ‘tomb’ of Jesus was found at the [western] location of a pagan shrine.” Eusebius lived in the Jerusalem area and knew this site was not the site of the crucifixion; but he understood that it was tantamount to a death wish to disagree with the Emperor’s decreed location. But perhaps the most basic problem with the traditional sites is that they do not fully meet the test of Scripture. This, of course, is a necessary condition to determining the true location of the crucifixion site. In addition, there are critical records from extra-Biblical Jewish and early Christian writers which are problematic for the traditional sites. I will address these issues in subsequent Posts. 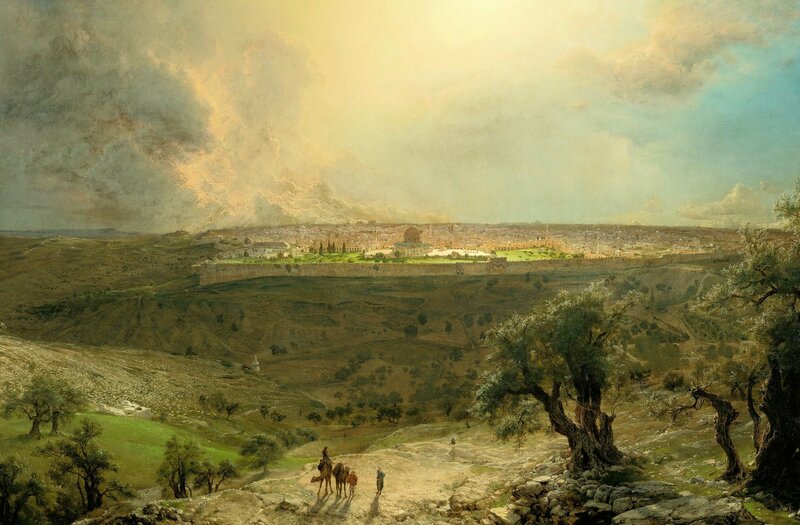 As I stated earlier, I fully support the Mount of Olives as the actual site for the crucifixion, burial, and resurrection of Jesus, a location which is directly east of the Temple. This is the case which I will make in the next several Posts. 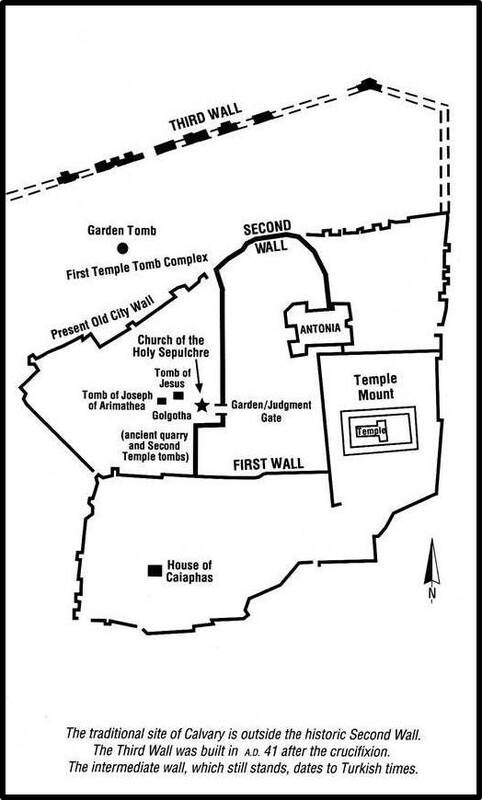 The following image depicts the two traditional sites of the Crucifixion and Burial of Jesus – the Church of the Holy Sepulchre and the Garden Tomb. Neither hold up to detailed scrutiny. Note: In my next Post, I will summarize the evidence for the location of the crucifixion as it is presented in the various Gospel accounts.